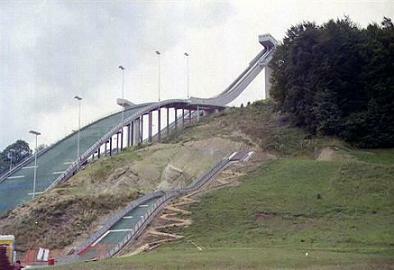 The first hill in Eschbach near Einsiedeln was opened in 2001, but only three years later the K20 "trial ski jump" was demolished already. 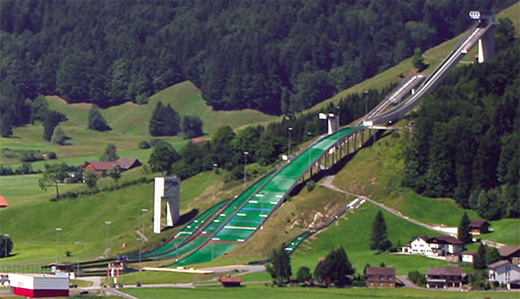 In 2003, the works for a new Swiss national ski jumping complex, which includes for hills K105, K70, K45 and K25, started. 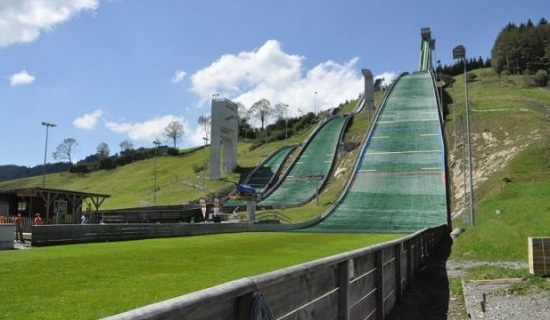 The hills, which also got a ski lift and snow cannons, were opened in July 2005. 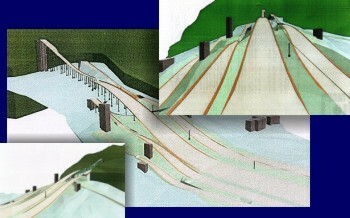 While the hills progressed, a landslip happened, so the works were delayed and the budget had to be extended. 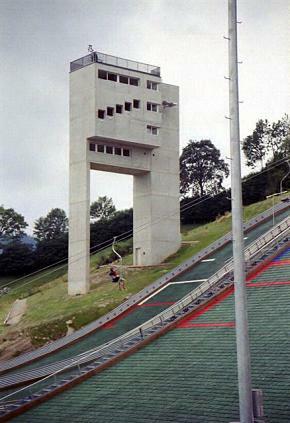 Furthermore the judges' tower had to be modified after the works were finished, because the view onto the athletes was not good enough. 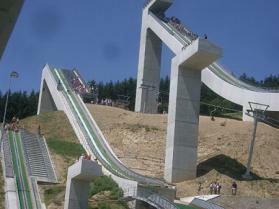 After two years of construction time and 14.5m SFr, a modern ski jumping complex was completed, but the financial cost was six million Francs above the original estimation and budget. 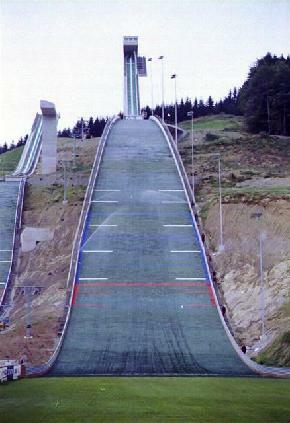 In the course of the building, the Ski Club could count on the support of the members, which installed the plastic mattings on all hills. 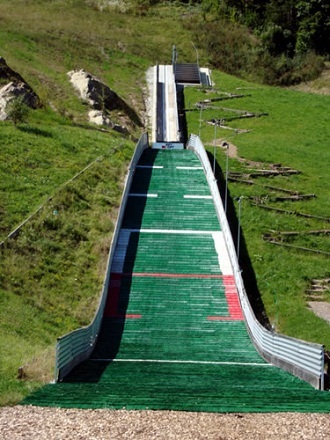 The complex is the main training center of Switzerland in summer, beside Kandersteg. The K105 is now used annually for COC and Summer Grand Prix. But it is also criticized, because of a lack of wind protection. 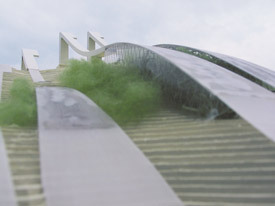 In 2009, the Grand Prix competition had to be cancelled after the first round, because the wind conditions were irregular. 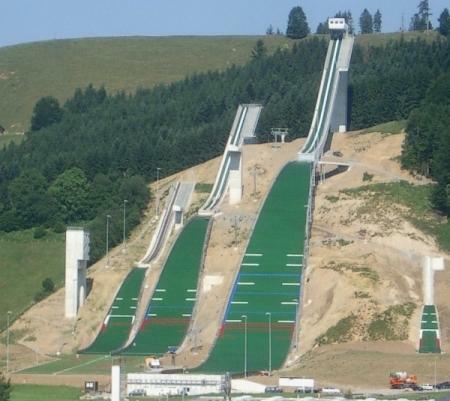 Also FIS-Cup and Alps Cup are making regular stops at Einsiedeln. 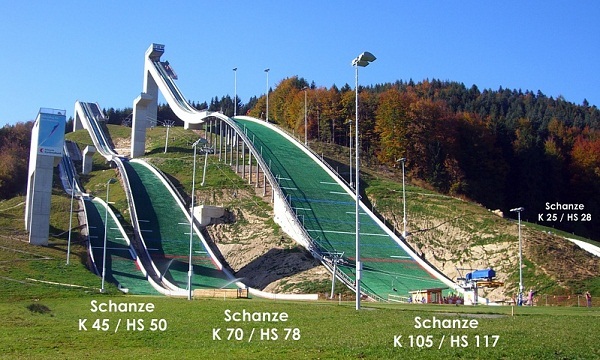 Originally the hills were named after the sponsors AKAD-, Swisscom- and KPT-Schanzen, but in May 2009 the HS 117 was dubbed “Andreas-Küttel-Schanze” and the HS 77 “Simon-Ammann-Schanze”. 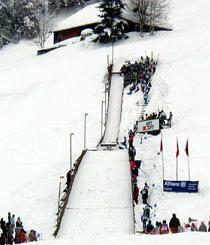 On the small KPT-Schanze, “ski jumping for anyone” is offered. 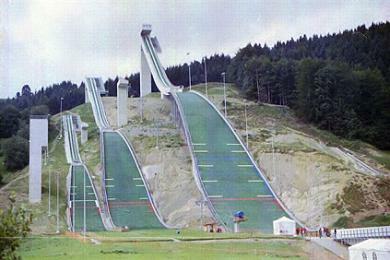 Beside the hills, the infrastructure at Eschbach was improved with the construction of a sports and ice skating hall. The K105 has got a very special highlight: the shower rooms and cabins are placed underneath the outrun. 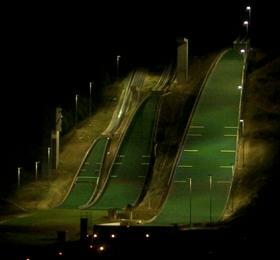 The hill has, like the K45, floodlights, so night competitions can be staged there. The "KPT-Schanzen" are natural hills, while the two larger ones have concrete inrun towers and the K105 even an artificial knoll. 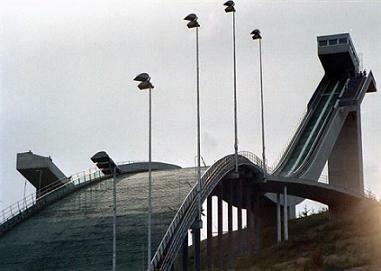 The ski jumping complex hit the news headlines in September 2007, when the operation company had to file for bankruptcy after several financial problems. 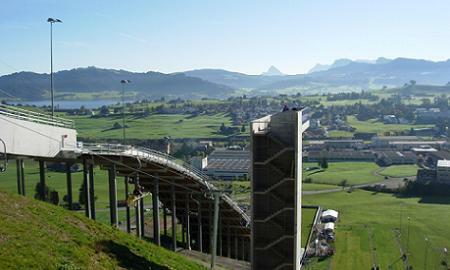 On January 1, 2009 the newly founded "Schanzen Einsiedeln GmbH" took over the rights and property ownership of the ski jumps. 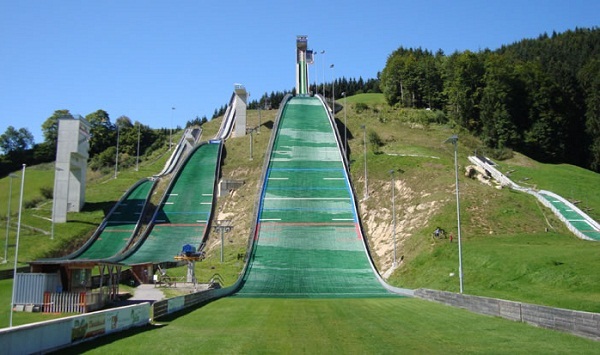 Even private ski jumping fans and public organizations hold shares of the hills now, just as the name giver and world champion of Liberec 2009 Andreas Küttel, who resigned in spring 2011.